Hydrocodone is commonly prescribed for the treatment of moderate to severe pain. Found in a variety of medications, including Vicodin and Percocet, a person may accidently take too much of the drug, resulting in overdose. There are many reasons why a person may overdose on hydrocodone, including the fact that they are not getting relief from pain as they are expecting. In other cases, overdose can occur when a person is taking the drug illegally, not knowing what is and is not a safe amount. Abuse of Hydrocodone can lead to overdose. When you take the proper dose of a medicine that contains hydrocodone, it is normal for some side effects to occur. While the main goal is to relieve pain, and this typically happens, it can leave you in a confused state. Upon taking too much hydrocodone, the first symptom is almost always sleepiness. In the most severe of cases this can mean becoming unconscious. The successful treatment of hydrocodone overdose is based largely on how soon after overdosing you are treated by a medical professional. If you are having difficulty breathing, it is common for medicine, such as naloxone, to be administered that can help reverse the side effects. In some cases, doctors will administer an activated charcoal with a laxative. This is meant to soak up any of the drug that is lingering in your intestines or stomach, helping to get it out of your system as quickly as possible. If you receive the proper medical attention without delay, you should be able to overcome a hydrocodone overdose without any major issues. Most people in this situation find that they are back to normal within a day or two. If you don’t receive immediate medical attention it is possible to suffer permanent brain damage. 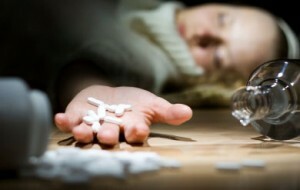 In the most extreme of cases, taking too much hydrocodone can result in death. Since hydrocodone is used in commonly prescribed drugs for pain, some people don’t fully grasp that they can take too much. The same holds true among many who take the drug illegally. The simple answer to the question of whether or not you can overdose on hydrocodone is “yes.” This can lead to serious medical problems and even death.